In my opinion, one of the most challenging jobs is that of the scout sniper. It takes a special breed of warrior to hunt the enemy like big game. In the US Marines, every battalion has a platoon of scout snipers. Some people have said that the Geneva Convention states that snipers are a violation of the Rules of War, however I have been unable to find it. Regardless, there is not a single (decent) military that does not employ them. Snipers are very highly trained individuals and can be critical to the success and failure of a mission. Snipers do not just shoot at enemy targets using pinpoint rifle fire from some location in the jungle, that is just the movies. 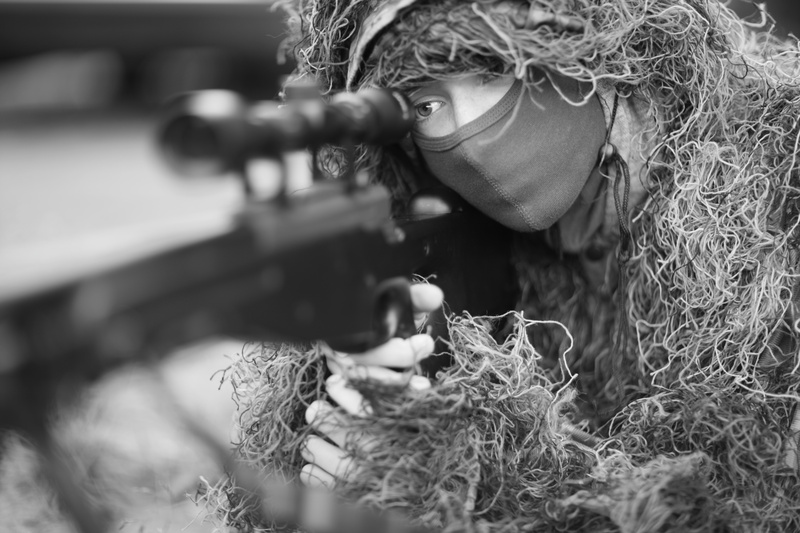 A sniper’s most important skill is observation, the next most important skill is stealth and THEN marksmanship and everybody knows a sniper has to be an excellent shot so he must be even better at the other two skills! When properly deployed, snipers work in two man teams. One is equipped with the sniper rifle and the other one is equipped with a weapon (either a SAW or assault rifle with a grenade launcher), a spotter scope and a radio. The sniper may also have another weapon in addition to his sniper rifle. The radio, not the sniper rifle, is the most dangerous weapon they have. With a radio those two snipers could lay waste to an entire division by calling in artillery, close air support, mortars, ect. Scout snipers also provide valuable information to the commanding officer. A two man team is ideal for stealth but not combat. A squad of ten men would have little problem dealing with two men if they found them. That is why snipers are so careful with their appearance and use ‘ghillie suits’. That is also why the second sniper is more heavily armed than the first. Snipers usually spend a lot of time on their hands and knees sneaking around. When it comes to killing the sniper team can do an excellent job. By hiding where they can see the enemy, the sniper team can make a call on the radio and cause all kinds of explosives to rain on the enemy. Doing this means the enemy has a much harder time detecting the snipers because they are not really doing anything. Furthermore, they can tell their commander what the enemy is up to so he can take advantage of the situation. Sniping is what snipers usually enjoy most though and they can be very effective. In most situations a sniper, even if he is a bad shot, can have a profound effect on the morale of a unit. Each man begins to feel that someone out there is taking aim at him and getting ready to pull the trigger at any time. This can be nerve racking to say the least! When snipers do become active snipers, they will find a very well concealed position. They will have to take into account all sorts of different factors like hiding the muzzle flash, masking the sound and most important, hitting a valuable target. The range to the target is critical as well as any wind. Heat should be considered since it can change the apparent location of the target, ect. The snipers are both highly trained marksman but they work as a team. One is the designated spotter, the other the shooter. The spotter uses a scope that has a much wider field of view than the sniper scope mounted on the rifle. This allows the spotter to see more. Also the spotter scope usually has additional aids built in, like range lines, that can help him determine the range. The spotter locates a target, determines the range and directs the sniper to zero in on the target. When the sniper fires the spotter determines where the sniper actually hit and gives the sniper directions to get on target if he cannot see. Both members, being highly trained snipers, can double check each other’s calculations and make sure they are the same. If they are different they do them again. The sniper rarely takes more than three shots. One shot is ideal because it is nearly impossible to tell where it came from. Two or more shots increase the chance the enemy will be able to determine where they are and maybe call in artillery or send patrols out. Any sniper who fires more than four shots before moving to another location is usually not very smart. One trick some snipers might use is shooting past a hill. The sonic crack of the round passing the hill may mislead the enemy into thinking the sniper is on that hill. Snipers, despite the Geneva Convention are usually an integral part of the battle. During the siege of Khe Sahn in Vietnam the VC would post a sniper on a nearby hill. The snipers really annoyed the Marines so the Marines would bomb the hill and kill the sniper. Eventually the VC posted a sniper that would fire but wouldn’t hit anybody. At first the Marines thought the VC was a real bad shot but then they figured out he just didn’t want to die. So to make sure he wasn’t replaced with someone more competent, the Marines began to ‘fake’ hits when he fired (which probably worried the sniper!). There are many different uses for a sniper and they can go from one roll (of scout) to another role (like sniper) quickly. For instance, during a raid, one or more scout sniper teams may infiltrate into an area before the rest of the assault unit. They will keep the objective under observation until just before the assault unit arrives. Then, right before the assault unit arrives they may take out different targets with pin point fire. One training raid my platoon did was have a couple scout snipers sneak into an area and begin monitoring the objective (a compound). When the assault group attacked, we came in quickly while the snipers opened fire on the compound. With snipers covering us using accurate fire, and the machine guns on the helicopters providing suppressive fire, the assault group fast roped out of the helicopters and attacked the objective. Everything happened very rapidly and in under five minutes an entire platoon had appeared and was on the ground assaulting the compound in a very aggressive manner. The battle was over quickly. Special Operation units might deploy a sniper on a helicopter to cover an assault. A helicopter makes it much more difficult to fire accurately but the sniper doesn’t have to worry about stealth and can take more than one shot. Helicopters also bring the sniper closer to the battle making it easier to hit. Snipers can be used to harass a unit in the defense. This is a very effective use of snipers because to the psychological impact it has on the enemy. It discourages them from moving out of their positions and makes them even more scared when they have to get out and improve their defenses. It also gives the commander an intelligence source for planning his attack. Snipers can also be used very effectively to protect minefields. Nobody in their right mind would be willing to get out in the open and start searching for mines when someone is shooting at them with very deadly, accurate fire. Before an attack begins snipers could be used to take out enemy leaders or machine gunners. During a battle snipers could be used to fire over friendly forces and take out important targets. Snipers can also be used to defend against enemy snipers. Because a sniper knows all the tricks he is more likely to know what the enemy will do, kind of like fighting fire with fire. Unfortunately (or maybe fortunately) the sniper may become a rare and endangered species. Current technological trends are oriented at crippling the enemy sniper. 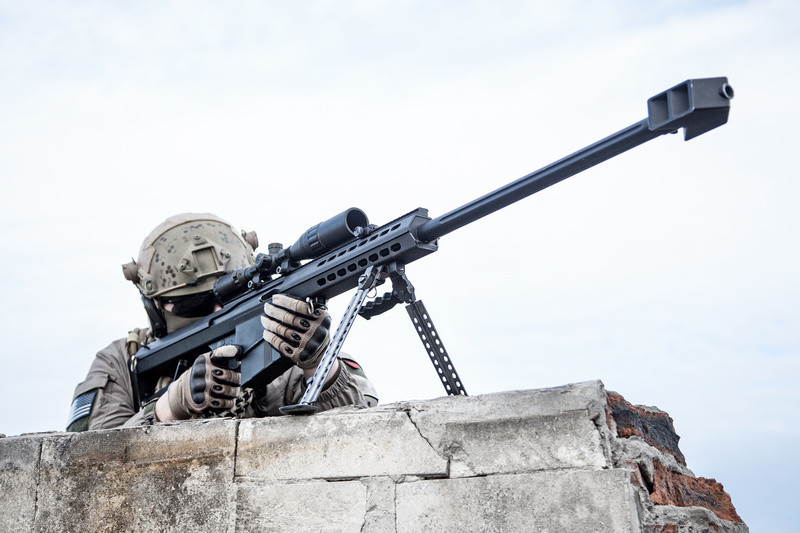 Four different technological systems are being developed to detect enemy snipers. Three systems include the use of microphones to triangulate the path of the bullet or the sound of the weapon firing. Even a silenced weapon will make noise that can be tracked, especially if it doesn’t use subsonic bullets. The weapon may be silent but the bullet will still make a crack when it passes something. If these microphones were built into a soldier’s helmet and the data was collated on a computer that displayed the data back to their helmets, a unit would have a pretty good chance of locating an enemy sniper that fired on them. The fourth method is the use of an IR scanner to detect the muzzle flash. At night it is much easier to see a muzzle flash with the naked eye, but during the day it is much more difficult. With the IR scanner it would be like detecting the muzzle flash at night, much easier. Battle computers that control the helmet display could record the muzzle flash and display it for the soldier as a fading red dot. This would also be very helpful in a regular battle. The muzzle flash is very rapid and the soldier might miss it if he is terrified. As a fading red dot he has more time to return accurate fire on that location. Lasers would probably be as easy to detect with the IR scanner as regular bullets because lasers generate heat and IR is all about heat. This does not mean snipers will become obsolete, especially in the regular order of battle, it simply means they will become more passive. They will be more likely to call in artillery or close air support than to fire. 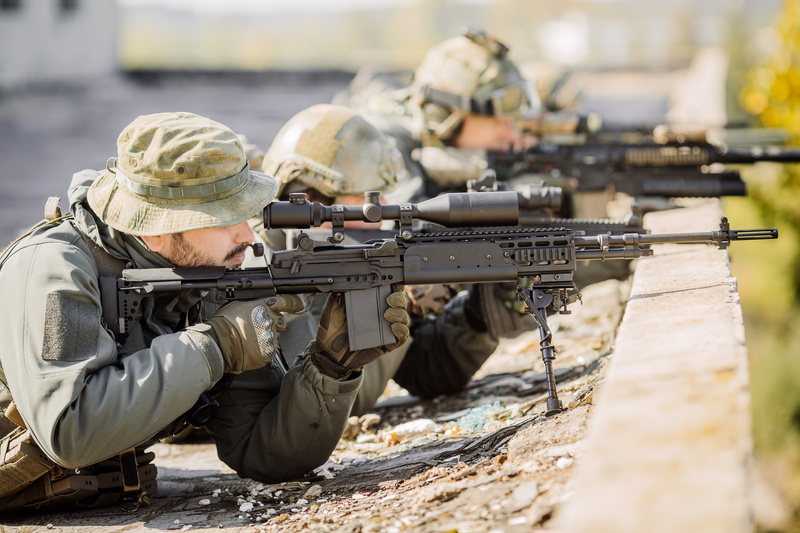 Stealth is, and will likely always be, the prime weapon of a sniper and it is the fear of the unknown that will make the sniper one of the more effective weapons in a commander’s arsenal.